OLPA is a journalistic romp through news, events, and politics of the Santa Barbara area, based on the community-access TV show co-produced by David Pritchett and Cathy Murillo. The show is not about dogs, but rather the spirit of offleashness with a twist of cinéma-vérité. Episodes of the show debuted every month or so on local cable TV channel 17, from early 2007 to late 2010. The video and a description are posted here. Take Your Leash Off !! OLPA replays at irregular times on cable TV, Channel 17, The Santa Barbara Channels. Enter search word LEASH at their Schedule of video replays. Our show is in hiatus! A double-feature(! ), these episodes of Off-Leash Public Affairs (OLPA) provides equal editorial and video production treatment of Monique Limón and Dean Nevins, candidates for the Nov. 2010 election to Santa Barbara School Board of Education. This election pits 4 candidates chasing 2 seats on the ballot, one as an open seat and another that is defended by incumbent Kate Parker. _OLPA Producer David Pritchett caught up with Limón and Nevins when they were speaking at separate neighborhood meetings held Sunday, 10th October 2010. Separate videos of each are below, which play(ed) together on Santa Barbara Channels, cable TV-17 (schedule below). _Both of these candidates easily can be considered qualified for the elected Board position, but each comes from markedly different backgrounds and experiences. 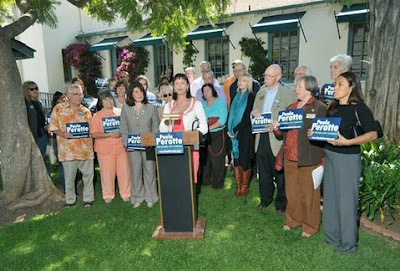 They each seem to share the same goals for Santa Barbara schools and students. They also may be competing for the same voter base, political watchers expect. _As a brief biographic comparison, Monique Limón, age 31, grew up in the same public schools she now wants to govern; she currently is on the local Board for Adelante Charter School, and for her day job is a manager at UCSB McNair Scholars Program, an office that advances educational achievement for undergrads. Dean Nevins, age 47, is a 6-year sitting Trustee on the smaller Goleta School Board; coming from San Luis Obispo, he moved to the area as a computer engineering graduate student at UCSB and now is the incoming Academic Senate Chair for SBCC faculty. What will you do about the diminishing School District budget and would you cut teachers and/or administrators to save expenses? Do you think that separate neighborhood elementary schools, charter schools, academy schools, etc. are setting up a separate, classist model of segregated school quality? What are a couple of things in your background or experience that would make you a good School Board Trustee? The video interviews for each candidate are about 14 min. long. Best viewed at high-resolution (480p) and full-screen size. __Introduced by Goleta City Councilmember Ed Easton and surrounded by friends, family, and supporters, Paula Perotte speaks during her election campaign kick-off event held at Goleta Valley Community Center, 13th September 2010. __When asked by Off-Leash Public Affairs Co-Producer David Pritchett about whether if elected Perotte would want to change the current agricultural zoning of the 240-acre Bishop Ranch, which is perpetually proposed by residential land developers, she responds with a definite no, stating: "I see no need to make any changes in the General Plan for the foreseeable future. That's a direct quote!" For this 8-minute video edited by David Pritchett --with plenty of noise from nearby busy Hollister Avenue-- cameras were run by David Pritchett and George Relles, with some still photos included by Paul Wellman from the Santa Barbara Independent website. During election season, this video also was played numerous times on the GreenScreen show of short videos by Santa Barbara Channels, community-access cable TV-17. 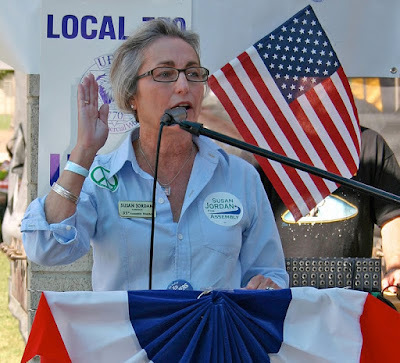 This episode features an election campaign event by Susan Jordan, Democratic candidate for California State Assembly, District 35 (map). The event with 100+ guests was held 14th November 2009 at the Hope Ranch home of Betty Stephens. In this video, Jordan speaks about her biography and readiness for this elected position, along with her accomplishments as an advocate for coastal and consumer protection in California. __The Statewide Primary election will be held 8th June 2010. Considering that a strong majority of voters in this Assembly District are registered as Democrats, the Democratic Party nomination in the June Primary often is considered a more vigorous and lively contest than the General election held later in November for Democratic versus Republican candidates. For the June 2010 Primary election, Das Williams is the Democratic opponent to Susan Jordan. __Touting the need for brass backbones in the fortitudinal combat of the State Assembly, speakers featured in this video include: Connie Hannah, long-time community activist and coastal protectionist (in a separate interview); Betty Stephens, host for the event and social and political activist-philanthropist; Susan Rose, former Second District County Supervisor; Sheila Kuehl, former Assemblymember and State Senator; Delaine Eastin, former Assemblymember and State Superintendent of Public Instruction, and Susan Jordan herself. __The end of this video includes 15 minutes where Susan Jordan responds to questions from the audience, as video content not included in the 28-minute version played on cable TV-17. Photos from the event were recorded by Kyle Woollet. Co-Producer Cathy Murillo recorded the video and co-Producer David Pritchett edited it. An 8-minute excerpt video highlighting Jordan's biographic remarks is at YouTube. For an alternative video host via Vimeo, select the Episode title atop this post. Camp Canine local business, DAWG dog "micro-chipping"
1. Off-Leash Public Affairs co-producer David Pritchett interviews Mary Sorosky and Jane Sorosky, proprietors of Camp Canine, a homegrown local business for doggie day care on East Montecito Street near Milpas Street in the mixed M-1 zone. 2. Also at Camp Canine, DAWG veteran volunteer Shirley Jansen explains the benefits of "micro-chipping" where a passive integrative transponder (about the size of a rice grain) is injected under the dog skin. A scanner can read the encoded data about the dog with the tag, so naked dogs still can have an identification. 3. The second location in this episode (timecode 7:25 min.) 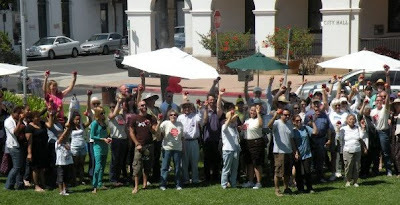 features the Healthy to the Core rally held 28 June 2009 at Plaza De la Guerra, downtown Santa Barbara. This event through Organizing for America promoted the health care reform initiatives of President Obama. Michael Just and other local people spoke to the crowd with their personal testimony on the health care crisis. Local Obama campaign organizer Sherry Holland also described the Obama health care reform effort accelerating in summer 2009. (Facebook photos by Vicki Allen). 4. The third location in this episode (timecode 17:30 min.) features OLPA co-Producers Cathy Murillo and David Pritchett conversing about local effects of the national health care crisis, skateboard parks, and a proposed Public Works Commission that David would want to form after getting elected to Santa Barbara City Council. 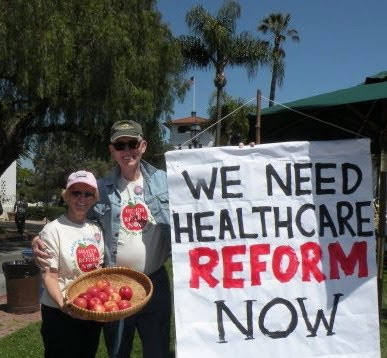 __Interviews mainly with Peter Conn, local champion for health care insurance reform with Health Care for All - California. Includes video of the Santa Barbara contingent participating in the huge One Care Now rally held 11 August 2007 at Los Angeles City Hall, with rousing speeches by Sheila Kuehl, Dolores Huerta, and a comedy routine by Lily Tomlin. __This video concludes with observations by Santa Barbara City Council candidate David Pritchett on the escalating health care costs that affect local government budgets. __Off-Leash Public Affairs (OLPA) first made a video about local health care reform efforts way back in July 2007 with Episode 003, Scrubs for SiCKO. The next OLPA episode (no. 038) will feature another health care reform event held 28 June 2009 at Plaza De la Guerra. 1. Off-Leash Public Affairs co-producer David Pritchett describes community efforts about schedule changes for MTD (Metropolitan Transit District) and how important riding the bus is for anyone who wants to be elected as a Santa Barbara City Councilmember. Line 8 for MTD was a particular focus by Pritchett through his participation in STUC (Sustainable Transportation Users Coalition) with its lead partners PUEBLO and COAST. Pritchett also briefly interviews San Francisco Mayor (and tall candidate for Governor) Gavin Newsom about his city experience with biodiesel fuel for their buses, during his visit to Santa Barbara on 20 March 2009. 2. 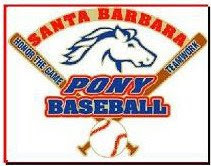 The second half of this episode features Santa Barbara PONY Baseball, scenes of ball games and ceremonies from Opening Day for the season that began on 14 March 2009 at MacKenzie Park. This segment includes a Spanish-language interview with a PONY parent. We thank Cheri Rae, another PONY parent for facilitating the coverage of this video story by Off-Leash Public Affairs. A video short of this Opening Day event also is up at YouTube. "What Happened to the Public Trust?" _To complement the film Citizen McCaw showing on SB Channels TV-21 starting 01 March 2009 (as CraigSmithsBlog reported), Off-Leash Public Affairs is please to be showing our own related production often scheduled for replay on TV-17 just before or after Citizen McCaw replays on TV-21. 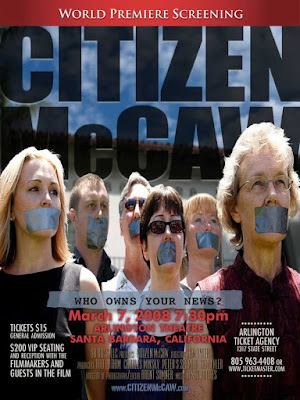 _This OLPA episode, Citizen McCaw World Premiere, features interviews about the News-Press-Mess from the crowds ready to see the premiere of Citizen McCaw when that local documentary debuted 07 March 2008 at Arlington Theater and 05 April 2008 at Marjorie Luke Theatre in Santa Barbara. 1. What do you think of The Mess? 2. Where do you get your local news? 3. If you could ask the News-Press publisher any question, what would it be? _The various responses were compelling, insightful, and/or amusing. Edhat was a popular and enthusiastic response as the source of local news, while others like Santa Barbara Daily Sound often were mentioned even though its readers often could not recall its name. That was in March 2008, though. _People interviewed for this video include: Rod Lathim (Citizen McCaw co-Producer and local community arts magnate), Sara Miller McCune (who reminded assertive OLPA co-Producer Cathy Murillo that a newspaper buyer first needs a willing seller), Al Bonowitz, Josh Molina, Roy Regester, Starshine Roshell, Brian Barnwell, Sander Vanocur, Ann Moore, the unknown comic's brother, the emphatic Shirley, and quite a few others who spoke eloquently but did not state their name or whose name (more likely) was lost in editing. _ OLPA episode 014 also covered an earlier chapter in the News-Press-Mess when the Teamsters Union prevailed in Federal court, twice. Encore replays of that video from January 2008 also is showing on TV-17 in March 2009, to pile on our Citizen News-Mess Fest. Watch the Video of this show!! For an alternative video host via The Google, select the Episode title atop this post. Nick Cavalier, 21, of Santa Barbara seemed to have everything he needed for his young life, plenty of friends, good parents, and a job at the beach. But all of that changed in an instant during a fight on Chapala Street in Santa Barbara six months ago. Cavalier sustained serious brain injuries that night when he tried to break-up a fight between his friend and group of young men. _This episode of Off-Leash Public Affairs features an interview by OLPA co-Producer Cathy Murillo with Faith Magdalena, determined mother of Nick Cavalier. They discuss what Nick is going through and her hopes for her son. _This video was recorded 11 Jan. 2009 by co-Producer David Pritchett, on the creaky side deck of Magdalena's home in the Mesa Alta West neighborhood of Santa Barbara. _Another casualty of the American Health Care Crisis, Nick Cavalier needs some long and expensive specialty therapy. On 05 Feb., his old and new friends held a fundraiser event, with a Facebook page. A fund for contributions under his name has been set up by Santa Barbara Bank and Trust (PO Box 60839, Santa Barbara 93160-0839). _SB Daily Sound reported on his plight, in addition to opinion essays by Paul Rivas at his Goleta blog and an Independent Voice by Faith Magdalena, which includes some highly lively and illuminating comments there. UPDATE (10Feb.2009) by Faith Magdalena: "The fundraiser was a great success. So much love and support! We will be planning another one at Deano's hopefully and then a homecoming BBQ at Ledbetter Beach. Nicholas will be entering Sylmar Health and Rehab Center [in Santa Clarita] instead of CNS in Bakersfield. I am very happy with what Sylmar has to offer in that they can help him with his learning how to maneuver with the lack of sight." 030... Will the New President Restore Our Liberties?